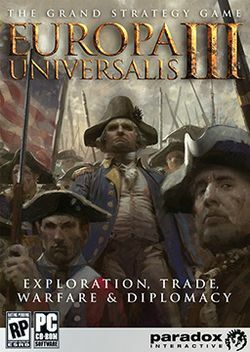 Europa Universalis III (Often Shortened to EU3) is a grand strategy game computer game released in 2007 for Microsoft Windows and MAC OS X. It is the third game in the Europa Universalis series. The original without expansions starts in 1453 just after the fall of Constantinople and continued through 1789 at the beginning of the French Revolution. However, the expansion Napoleon's Ambition extended the timeline to 1821, and the expansion In Nomine expanded the timeline backwards to 1399. This page was last edited on 29 May 2016, at 18:56.